I write as I am already halfway through my third and last course prior to submitting my entire diploma. I have 4 1/2 couples (the remaining half is an ex-pat in the Middle East, and I am sincerely hoping we will have the pleasure of his company next time). All of them seem to be lovely, normal, and game to give everything a try. This is great news for me and for teaching them. They are like sponges, soaking up everything we cover. It has been very rewarding for me. I wonder, though, is this luck or good teaching? I did do a better job at explaining what’s going on during introductions, as well as explaining how one of the NCT’s prime objectives is informed decision-making and a smooth journey into parenthood. Maybe they took that on board exactly how I hoped they would. I also feel much happier with the activities I am doing. They are neat and tidy, I feel they work well, and I am better organised than I was last time round (something the assessor mentioned in my last course). Better still, I’m mixing up antenatal and postnatal activities, since it helps to keep a good balance of what’s important. After all, labour is one event, and parenting lasts a lifetime. Mixing up the activities shows that there is a good balance of content throughout the course. I’ve heard people complain about not doing enough postnatal stuff if you mix it in, but I’ve been careful to acknowledge what we’ve covered from the original agenda setting exercise at the beginning of the course, and show the items on the list being crossed off from session to session. It also stops stuff from getting too samey. Another thing that went down brilliantly was having a decent shared lunch in the middle of the session. I allocated an hour for lunch, and everybody helped out bringing stuff and setting up. We had the branch volunteers come and talk to us at the same time, and everyone was getting on like a house on fire – I was even praised for it on my mid-course evaluation. It was also really great to see the men getting on so well. After one coffee break, I had to drag them back inside, they were getting so involved in their conversation. Wonderful. I heard from other teachers that an intensive format (the bulk of this course is being taught over two 6-hour Saturdays) can be difficult for bonding, but it doesn’t seem to be a problem here. Whether it’s down to luck or judgement I’m not sure, but I’m certainly glad things are going so well. We’ve ranged from easy topics (straightforward labour, practical babycare, safe sleeping) to more challenging ones, and whilst it was clear that subjects such as interventions and caesarean were quite a lot to take in, they still listened, asked questions and kept an open mind right the way through – though they were relieved to go onto some lighter stuff straight after! I had one negative comment on my evaluation forms, which was that at one point I seemed a little disorganised (my epidural kit had gone missing – I found it shortly afterwards). And no doubt I can be better organised. But, for now, I know that I’m a lot more organised than last time and the time before, and so I’m happy to keep trying to improve for now. Who knows? Maybe my next session will be perfectly organised! All in all, though, I’m delighted with the way this course is going. I’m really enjoying it, and I also feel like I am making a difference to these people. It’s exhausting teaching for six hours straight, but I do like the format in spite of that. I hope I am still this positive after next weeks class. The ex-pat is due to return to the UK this week, although it’s unclear whether he will be able to make time for the course… if he does come, it may upset the balance, I’m just not sure yet! But I’m not going to worry about that just yet. It will be what it is, and that will be fine. I’m sorry to say it, but I am going to have to take down my Postaday 2011 banner. I’ve been quiet this week. Not on purpose. I still have lots to say. But Life™ just stepped up a gear. And I really can’t blog every single day any more. Why is this? I hear you ask. Well, part of it is trying to do more exercise. Once you make a commitment to exercise three times a week, and you take into account travelling to and from a class, and possibly settling a baby into the creche, or queuing outside the studio because if you don’t there won’t be a space for you, it can be rather time consuming. There’s the other thing. I came off time out back at the beginning of May. And somehow, I kept the blog going in spite of returning to training and having many, many things I needed to do study-wise. I’m not sure the quality was quite up to scratch though…you’ve all been very polite and not said anything, but I know that at times I could have done a better job. Now, I’ve got a course coming up in the next couple of weeks. In the long run, when I’m qualified, this shouldn’t take up too much time, but right now, while I’m trying out different ideas and activities, there’s an awful lot of planning needing doing. Even now, as I type away, my eyes keep flicking over to the bookshelf I should be bustling around, looking at what activity to put where. I love this blog. It helps me achieve peace of mind, and balances out my thinking, and it shouldn’t be making me feel guilty… But right now, I do. There is actually something more important I have to go and do. So, the banner has come down. I will still blog regularly – at the absolute minimum one post a week – and about the same stuff. And maybe at some point I’ll be able to blog daily again. But right now, it is the fallout from just a few too many things going on. I looked up the definition of ‘fallout’, and it talked about fallout being the tiny particles of dust, ash, or indeed radioactive by-product from some kind of explosion or eruption. Don’t worry, I haven’t exploded or erupted. But I do sometimes think of this blog in that way. I think about stuff a bit too much. My head tries to explode. Blogging vents off all the extraneous thoughts that I can’t deal with elsewhere. Blogging is a kind of fallout. In a good, non-toxic way, you understand. I write this on the eve of a work-based trip to Manchester. A colleague is doing the driving; all I have to do is take in the sights – mostly of traffic jams on the M6 – and I get around 40 hours away from small people and loved one. It’s at times like this that I have to remember who I am without all that other baggage. If I don’t identify myself as a mum, or as a wife, what I have left is music (not what the trip is about) and my training (entirely what the trip is about). I am going to spend two whole days behaving like an adult, or at least, behaving as if I were the most important person that I have to deal with on a regular basis. If I have music and antenatal teaching to outwardly define me when I’m out on my own, what does that mean? I am using the words as if they were labels. I feel strongly that they are not, but nevertheless they are the two most important things in my life after family. Since this trip is all about antenatal teaching – a study day and a national forum – perhaps I should try to work out why that in particular is so important to me. Earning money as an antenatal teacher is a bit of a joke; unless you compromise on family life, it’s very difficult to work for more than sixteen hours a month or thereabouts, and it’s quite difficult to manage even that much with the current bookings system. So, it couldn’t possibly be about the money. What teaching antenatal classes means to me is the opportunity to help people find their way through such a special time in their lives. They come to the first class anxious, scared, knowing very little, and by the time they leave to have their babies, they feel revved up and ready to face the challenges and wonders that make up childbirth and becoming a parent. It’s amazing to be able to give people the tools to help themselves through what can sometimes be a very difficult period, and to see them make friends for life through the classes. Nevertheless, when I go to these big forums or conferences, I do feel very intimidated. I, a mere student in a sea of qualified teachers, unused to the hustle and bustle, and not entirely sure I belong at times. Particularly on this occasion, when events have caused me to question things in a way I wouldn’t have dreamed of a year ago. So, I’ll go, and I’ll feel small and insignificant, but at the same time I will revel in doing something that means a lot to me, and that has nothing to do with family. I say that, of course, but…I would never have been inspired to teach if it hadn’t been for my family. Funny how these things come full circle, isn’t it? First the bad news. In spite of 8 or 9 viewings, our house is still considered to be too small. 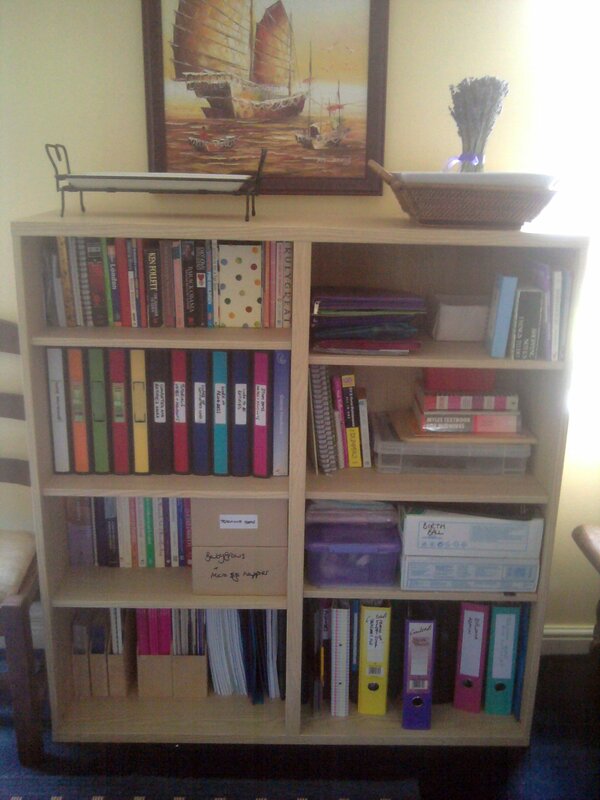 This weekend, therefore, we tackled the study (currently also smallest one’s bedroom) and removed my ‘teaching’ shelves. As a student antenatal teacher, I have absolutely masses of, for want of a better term, stuff. We are expected to provide numerous visual aids during classes as they tend to liven up the atmosphere and bring a bit of reality into it. After all, can you imagine going to an antenatal class to have someone drone on at you with the help of a Powerpoint presentation? Naturally, my shelves are full to the brim of babies, birth balls, handouts, study texts, files, and there’s even an electric breast pump hiding in there somewhere. And, if I’m honest, there’s plenty more in the garage waiting for my next course, not to mention heaps of dolls currently being borrowed for a friend’s class. But loved one and I agreed last week that they would just have to go. We didn’t know how, since I need the stuff, and we didn’t know where. But then, in an anti-essay-writing-procrastination brainwave, I realised that half of my shelves might just work in the living room without causing another room-being-too-small issue. Mentioning it to loved one was like setting an enthusiastic match to very dry touch-paper. No sooner had the words left my lips than he began gleefully carting all my paraphernalia downstairs. Come Sunday morning, it was impossible to move in the lounge for all the journals, lever arch files, boxes of babygrows and the like. On Sunday afternoon, with the choice of getting on with it, or having nowhere to sit and veg in front of the TV, I got down to business. Helped by smallest one, I cruised through mountains of journals and annihilated all the horribly out-of-date ones. I streamlined my filing and removed the mountains of articles I’d already read and had made notes on. I turfed out heaps of public-access documents I can now access online any time I like. I found all the things I’d lost prior to smallest one’s birth. I even have a spare lever arch file and four empty ring binders. I’m feeling quite pleased with myself. I almost feel – dare I say it – organised. I am particularly impressed with my ability to more than halve my storage requirements; I even brought some non-teaching stuff in to fill some space. Needless to say, upstairs suddenly looks cavernous. People might finally believe that we happily had a super-king bed in there for a while. And who knows? Maybe my shelves will stay looking this good. Heaven forbid, maybe someone will start to think the house is big enough now. Many of you have had experiences of being in a foreign country with language issues – I can recall a couple from my three-month exchange trip to Germany as a seventeen-year-old, mixing up the words ‘satt’ (full) and ‘voll’ (drunk), ‘ohne zweifel’ (without doubt) and ‘ohne zwiebel’ (without an onion), et cetera. Teaching in a foreign country, I imagine, must have similar linguistic pitfalls, but more of them. So I was delighted to stumble across Stupid Ugly Foreigner’s site a couple of months ago. When it’s not funny, which it usually is – very – he also takes some amazing photos. This is the post that had me snorting with laughter – and trying not to – whilst smallest one is sleeping in her cot a few feet away. I hope you enjoy it as much as I did. And don’t let that first photo put you off.